Angara’s remains were brought to the Senate for necrological services attended by his family, friends and former colleagues in government and the private sector. 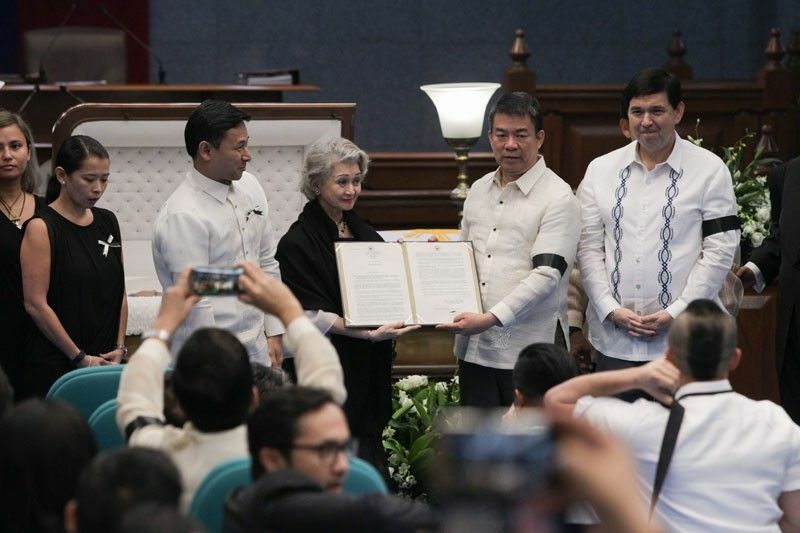 MANILA, Philippines — Former presidents, senators and friends yesterday took turns paying tribute to the late Senate president Edgardo Angara, who was cited for his numerous contributions in the field of education, economy and the arts. His body was brought back to the Heritage Park in Taguig City. Tomorrow, his remains will be brought to the University of the Philippines in Dilliman where he once served as president. His remains will be brought to his home province of Aurora on Saturday. Interment will be there on Sunday. Former president and incumbent Manila Mayor Joseph Estrada said he knew he could rely on Angara’s “honesty, intelligence and competence, and his goal of lifting Filipinos from poverty,” when the latter was his runningmate in the 1998 elections, and served under him as agriculture secretary. “I consider it a great honor to have known him and be his friend. Thank you for your service and love for country,” he said. Former president and incumbent Pampanga 2nd District Rep. Gloria Macapagal Arroyo recalled how her father, former president Diosdado Macapagal, predicted “a bright political future” for Angara when they worked together in the 1971 Constitutional Convention. “Edgardo Angara was a giant among legal luminaries and a skillful public servant. He wore many hats and he wore them well,” Arroyo said in her eulogy. “The impact of his principled work is larger than life – on the old and the young, students, farmers, economy and education,” she said. “Not only are these laws many; they are meritorious. Today, they are valued as national assets. Unfortunately for him, laws one had crafted cannot be reported as assets in one’s SALN, otherwise he would have been the richest senator in history,” Recto said.